「夜のA-FACTORY」I’d like to introduce you a new fantastic spot nearby Aomori station. On December 4th, I visited the first day of A-FACTORY. It has a gift shop, a cider factory and a restaurant which boasts dishes using ingredients made in Aomori. It is located only a minute’s walk from Aomori station. You’ll see this building when you go straight to the direction of Bay Bridge. Vegetables fresh from farms, processed products and gifts are available. Since it was the first day, there were many people in the factory. Potatoes, tomatoes and products grown in Koganesaki farm, which is seldom seen in most shops, are also available. There were many kinds of products from throughout Aomori prefecture, such as mackerel-related products. The following pic was taken in the restaurant. This is Arpajon, which is widely known in the country. The man on the top-right picture gave a candy art making demonstration. You can see people making cider through the glass. Cider is a type of fruit liquor which is fermented apple cider. If you want to see more information about Cider Factory, visit here. You can enjoy not only buying gifts but also a factory tour and eating delicious foods. 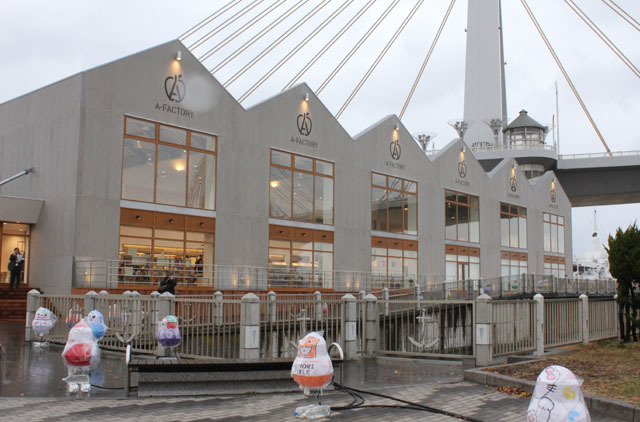 A- FACTORY has various attractions all under one roof! Located next to Aomori station, it is easily accessible. And also it is in a prime location overlooking the sea and a passenger ship, the Hakkoda memorial ship. You can stop by the Nebuta-no-ie Warasse, which is dedicated to advertise the Nebuta festival.